KANSAS CITY, Mo. 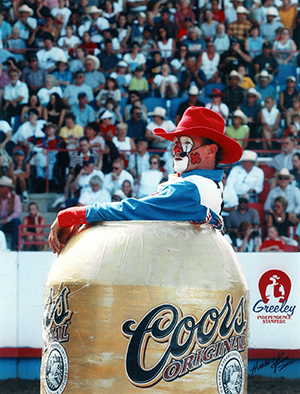 – Keith Isley is one of the most decorated clowns in rodeo. Now Isley will bring his brand of funny to the American Royal Rodeo, set for 7:30 p.m. Friday, Sept. 27, and 2 and 7:30 p.m. Saturday, Sept. 28, inside Hale Arena at the American Royal Complex. “I thoroughly enjoy watching people have a good time and enjoy what I do or what I say,” said Isley, 55, now in his 20th year in ProRodeo. “Just seeing people enjoy it and have a good time. Sometimes later in the year, you’ll get home and have some letters for you and have some pictures of you that kids have drawn. He has accomplished much. He’s been named the Professional Rodeo Cowboys Association Clown of the Year six times, the Coors Man in the Can five times, the PRCA Comedy Act of the Year five times and PRCA Specialty Act of the Year three times. For three straight years, from 2009-11, he won the funnyman’s trifecta: Clown of the Year, Coors Man in the Can and Comedy Act of the Year. That’s just one piece of the puzzle that makes Isley such a commodity. In addition to being one of the best funny men in the business, he also has some of the top acts in rodeo. He’ll bring it all with him when he arrives at the West Bottoms for the American Royal. It’s just part of the job for Isley.